Friday Night Wired! | Simon Says… You really should drink this! ← O’Hara’s Notorious, it’s a Knock Out! Spoiler alert! I think Oatmeal IPAs might just be my new favourite thing. 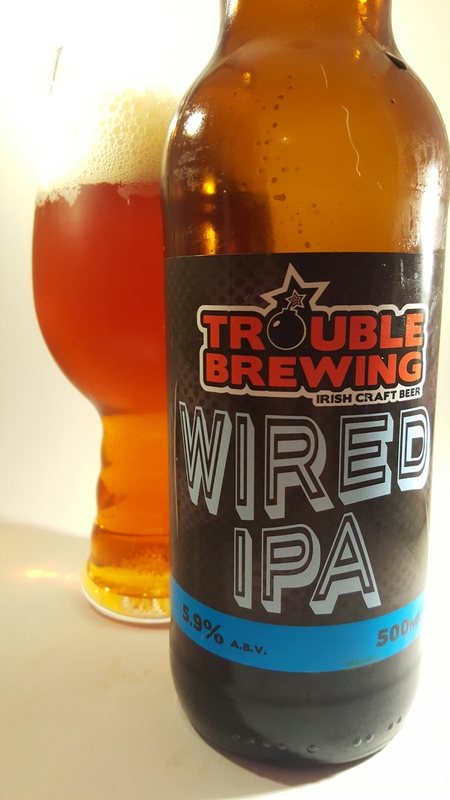 Hot on the heels of Stone Barrel’s we have Wired from Trouble Brewing. This one is hopped with Mosaic, Simcoe, Magnum and El Dorado. The Mosaic and Simcoe really stood out. The beer is packed with lots of tropical Mango and Pineapple flavours. It’s a right juicy brew. The Oatmeal gives it a nice smooth round flavour. Delicious. This one is won’t be around forever so make sure to give it a go. Sláinte! This entry was posted in Uncategorized and tagged Beer, hops, irish craft breweries, Oatmeal IPA. Bookmark the permalink.